The Ministry of the Interior of the Republic of Lithuania and the Migration Department under the Ministry are in charge of all related issues concerning the UK citizens and their family members who wish to reside in Lithuania after Brexit. Europe Direct Contact Centre (EDCC, tel. 00 800 67891011) has a reinforced its call centre service for citizens, businesses and other stakeholders to deal with questions related to Brexit. The opening hours of the EDCC have been extended to the weekend, accepting queries in English, French, German, Italian and Spanish between 09:00 and 18:00 CET. If I am already resident of the Republic of Lithuania, do I need to change my documents and to apply for my new residence permit? Yes, you do. The application for the new residence permit should be submitted during the transition period of 9 months starting directly after Brexit. How much time does it take to issue or renew temporary residence permit? The application should be examined no later than within 3 months as from the date of submission to the Migration Department. Will I have to comply with Lithuanian integration requirements when Britain leaves the EU? No, British citizens who were legally resident in Lithuania before the UK’s withdrawal will retain their right to live, study and work here for 9 months after Brexit. This will also apply to family members of British citizens who are not EU citizens themselves. From the Brexit day British citizens will need to apply for residence permits according to favourable requirements (more information provided in due time). You or your employer will therefore have no need to apply for a work permit on your behalf. Will I be able to bring family members to Lithuania after Brexit? You can bring your family members to Lithuania. It does not matter how long you have lived in Lithuania. As a British citizen, can I apply for Lithuanian citizenship? Yes, you can become Lithuanian by naturalisation. Can I acquire Lithuanian citizenship and keep my British citizenship? No, but with some exceptions. Which authority is responsible for British citizens in this context? The Ministry of the Interior of the Republic of Lithuania (MoI) and the Migration Department under the MoI are in charge of all related issues concerning the British citizens and their family members who wish to reside in Lithuania. Yes, you do. The application for the new residence permit should be submitted both with British citizen during the transition period starting directly after Brexit, or right after British citizen would receive new residence permit. Yes, there are. In case your studies will last longer than 31st of December 2019 (preliminary date, may change due to the Brexit situation) you will need to apply for residence permit on the ground of studies. You will have nine months transitional period starting directly after Brexit to apply for new residence permit. Please be aware, that the procedure of issuing temporary residence permit takes up to three months. No, you don’t. However, in case you want to work longer than till 31st of December 2019 (preliminary date may change due to the Brexit situation), you will need to apply for temporary residence permit on the ground of work. Such residence permit will allow you to work without work permit. Please be aware, that the procedure of issuing temporary residence permit takes up to three months. If you have acquired the right to drive in the United Kingdom before Brexit, when you return to live in Lithuania you will be able to exchange driving licence under the same conditions as before (when the UK was still a member of the EU). This means that you do not have to take driving tests (theory and practical) when exchanging your driving licence. also check your health and get a medical certificate. driving licence issued by the UK. NOTE: If you have acquired the right to drive in Lithuania, but you have exchanged your driving licence in the UK (before or after Brexit), the driving licence will also be exchanged as usual, i.e. in the order described above. If you acquired the right to drive in the United Kingdom after Brexit, when you return to live in Lithuania, you will only be able to exchange your driving licence by passing the theory and practical tests (driving school training is not required). When you pass the driving tests, you will be able to exchange your driving licence. 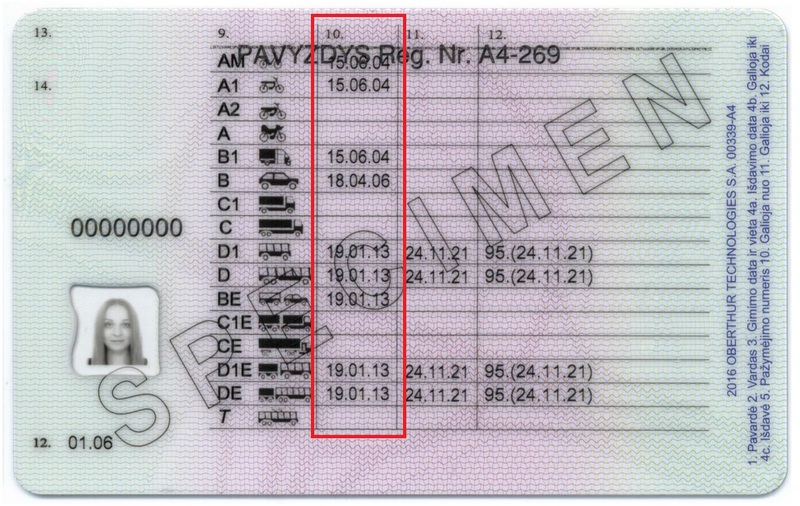 UK driving licence with its translation to Lithuanian (translated by translator).